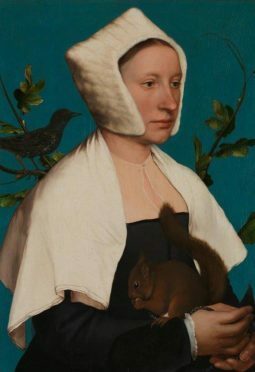 A Lady with a Squirrel and a Starling by Hans Holbein. More than 5,000 people have visited a special exhibition of a 500-year-old Hans Holbein painting at the Shetland Museum. Curator Ian Tait said the National Gallery loan of the painting A Lady with a Squirrel and a Starling has been one of the most successful exhibits the museum has ever had. Holbein, who was born in Augsburg, Germany, at the end of the 15th century, is perhaps best known for his portraits of Henry VIII and the nobility of the Tudor court. Mr Tait said that over the year exhibitions focusing on “history greater than Shetland” had attracted the highest visitor numbers, such as the shows on dinosaurs and ancient Egypt. He added that with the help of an ambitious learning programme it had been possible to engage with audiences that would normally not be expected to enjoy a visit to the museum. Mr Tait said: “Through the learning programme we not only managed to enthuse primary bairns, but the most notable thing for us was that we have been able to connect with demographically unlikely audiences like teenage boys. “Teenage boys are, of course, famous for not wanting to engage in such hoity-toity fair as medieval art, but they have been very enthused by it. “They were absolutely flabbergasted by the fact that a) the paining was the real thing, because, I suppose, nowadays in the era of electronic gadgetry a picture is precisely that, so they couldn’t believe it was the real thing, and b) the fact that it was 500 year old, an impact that was not lost on them at all. A Lady with a Squirrel and a Starling by Hans Holbein the Younger is open until July 15 and entrance is free.